Okura Robata Grill & Sushi Bar, 858 S. Coast Highway, is holding weeknight events aimed at creating community. During Vino and Art Night on Thursday, April 30, guests can create their own acrylic painting, with all supplies provided, guided by local painter Jessica Byrne. The $50 per person 6-8 p.m. Vino and Art session includes wine and dinner. 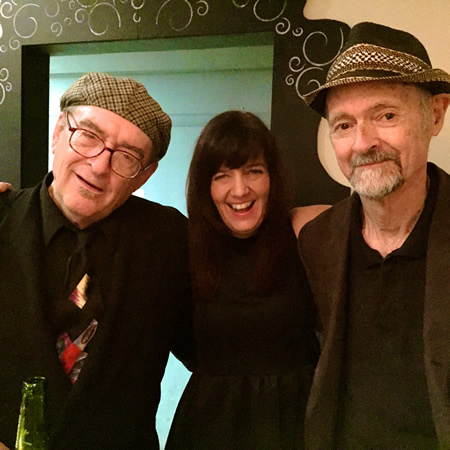 Vocalist Victoria McGinniss with Lyle Rennick and Jack Prather perform at Okura. On Tuesdays, Okura holds a locals night with the Victoria McGinnis Trio performing from 6:30-9:30 p.m. All-night happy hour will remain in effect every Monday and Tuesday. Spend an evening with Chef Azmin Ghahreman of Sapphire Resturant, and Darioush Khaledi, owner of Napa Valley’s Darioush Winery, for a four-course menu with wine pairings Tuesday, April 28. RSVP for the $175 per person dinner, 1200 S. Coast Highway, at 949 715-9888.